I purchased the FF767 on Black Friday recently (it was discounted) and installed it correctly V1.1.32, and it works OK in Xplane 11. BUT the CDU will not import flight plans from PFPX. I keep getting the message "route not found". Your advert for the B767-300ER states that you can use Professional flight planner X to export routes to the CDU. So I purchased PFPX to load plans but each time the CDU reports "ROUTE NOT FOUND"
Have I wasted my money or is there a glitch in your program? Ok, the path is correct but the format is wrong. The plane supports the Aerosoft Airbus Extended co-routes format, the manual supplied with the model contains this information, did you read it? The answer you were given and which you quoted in red letters is the solution. then the only format I can seem to save is .fms. as shown in the attached screen shot. I see no mention of *.fpl format anywhere in Xplane. Is there something I am missing? and how do I find Aerosoft Airbus Extended folder to export (place) to? Please show your PFPX export window (where you select the export format; "All Addons" tab in your picture, I guess). There is NO Addon for the Flightfactor 767-300 just generic Xplane. As there seems no answer to my problem, I have been entering the flight plan waypoints manually and this is NOT what I paid 70AUD for. Plus it is a VERY tedious job on a long haul flight. The answer to your problem has been given already. Export it as for the Airbus X Extended. It should be in the window you posted a screenshot of right at the very top of the list. There you enter the path to the coroutes folder of the 767. BUT I am constantly getting the display "ROUTE NOT FOUND" in the CDU after saving to the co routes folder as mentioned in my first post. This is because it save my plan as *.fms format. as shown in the post above on Thursday last. I just give up now and will find a REAL flight planner that the 767 will accept, becuase this has been a nightmare and I firmly believe it has been false advertising on the FlightFactor sales page quote: Load company routes generated by Professional FlightPlanner X (or other compatible programs) directly into the FMC. You can believe whatever you want, sure. And you can claim whatever you want. But it works for me and probably most other people. And if you export the route using the Airbus Extended selection you don't get an .fms file out of it. You just don't. Taking the Airbus Extended export option results in an .flp file and guess what: it works that way. You just select the wrong export option as is seen clearly in your screenshot and what I tried to address in my post on Monday. 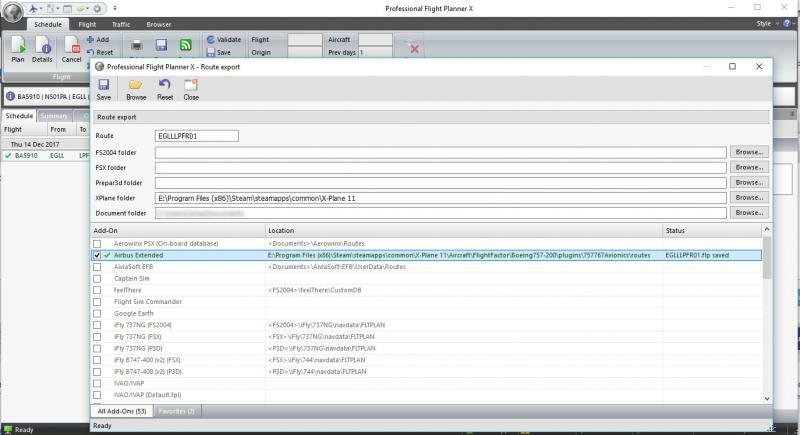 Please be careful when claiming false advertising on FlightFactors part when you struggle to handle PFPX. We are here to help but such untenable assertions do not help at all. Please report back if my attached screenshot helps in any way. As I have told you, you do NOT search for Flight Factor. You click the "All addons" tab on the lower part of the export window and there you select "Airbus Extended". You have been clearly instructed several times to NOT do this. You have been instructed to select the file format "Airbus Extended". Do not get confused by the name. Even though the file format is called "Airbus Extended", it is still the one needed by the Boeings from Flight Factor. So please do as instructed and try again. I installed B767-300ER directly inside .../Aircraft. Is it wrong? Should I create a FlightFactor folder -> ...X-Plane11/Aircraft/FlightFactor/Boeing767-300ER? 2) There is an ...X-Plane11/Output/FMS plans folders and I think is where PFPX flightplans should be exported. Am I wrong? 3a) navdata (Airports, ATS, cycle, navaids & waypoints) plus a Proc folder. 4) Is there a correct place to export PFPX to 767-300ER? Hey mate, I personally put the aircraft in a separate FlightFactor folder, yes. There is also the 757 and the 777. But technically it shouldn't be necessary. For me, it's only for keeping it a bit more structured. The thing with the Airbus Extended (and yes, it is an FSX/P3D addon, don't be too surprised) is that many addons are using the format that the Airbus Extended by Aerosoft employs. So no, no need to buy it anyways, we are talking about the export option for the Airbus Extended that you have to use in order to get the route into your FMC. To your second question. Yes, but this is only for default X-Plane flight plans. You can export them via PFPX but the default X-Plane format does not help you with the FlightFactor aircraft. Thanks for the input guys and at LAST, the confusion regarding Airbus extended comes to life with that Screenshot from Kiddow. The program now seems to work...I just have to figure out the fuel required for each trip. PFPX is a flight planning tool and thus, of course, able to calculate the necessary fuel. I'd like to say tks. I created a path ...X-Plane 11/Aircraft/FlightFactor/FF767-300ER and everything is ok.